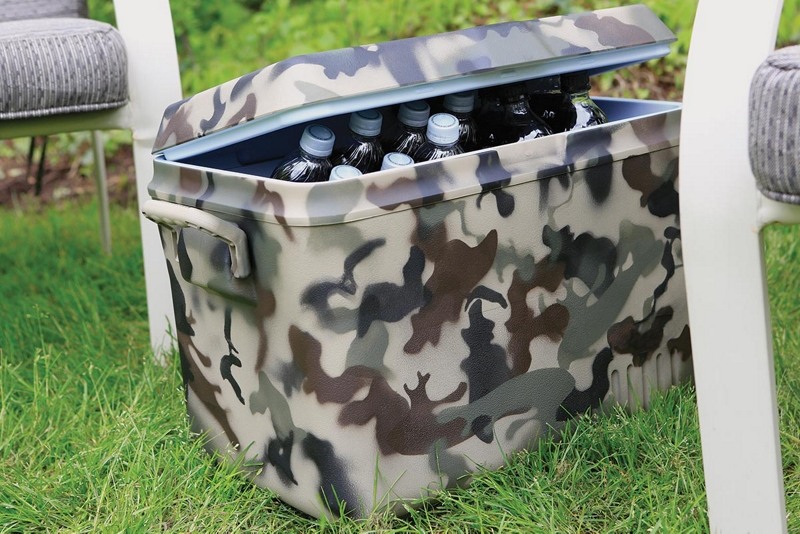 Make an average cooler stand out by helping it blend in with Krylon® Camouflage Technology. Using an all-purpose cleaner, thoroughly clean the inside and outside of the cooler to remove dirt, oil and debris. Rinse thoroughly with water and allow to dry. Applying in a well-ventilated area, paint the cooler using the following color order of application for best results: Khaki, Olive, Brown and Black. With your Camouflage Khaki well shaken, place stencil as close as possible without touching, hold the can of paint 6-8 inches away from the surface, spray in short bursts to create desired appearance. Repeat around entire surface of cooler. Repeat step 4 with Olive, Brown and Black Camouflage paint colors using various stencil shapes to create desired appearance. Krylon® Camouflage Paint dries in 15 minutes or less and can be handled in about one hour.